Steve went to the Chief's game on Sunday, so the kids and I decided to start "spookifying" our front porch. I still need to get some pumpkins to finish it all up and then I will share the whole porch with you. 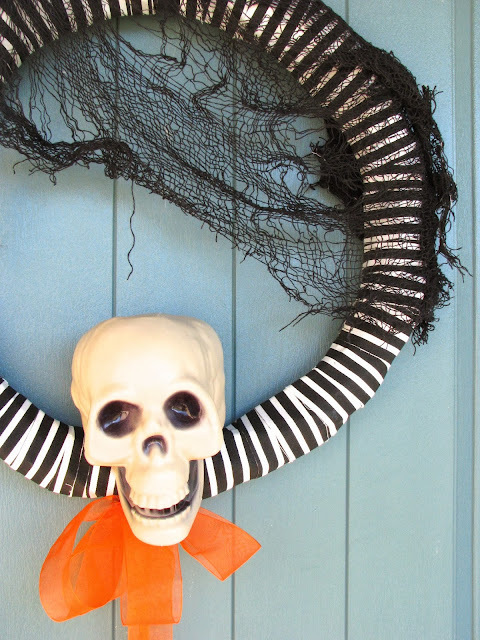 Until then, I wanted to show you how I quickly changed up my black/white striped spider wreath from last year. Walking tacos are so easy to make and fun to eat too! Your kids will get to eat dinner out of a bag of Doritos…need I say more?! Kate and I felt like baking the other night, and I had everything I needed on hand for these cookies, so we gave them a try. I had never made cookies with coconut oil before, and these turned out so good! Definitely a keeper recipe! Slowly but surely, the entry/exit doors on the first floor are being painted black. The door to the back patio is black on both sides. Now the mudroom door is also black on both sides, after the interior door recently got a paint job. A few weeks ago, I posted about the framed wrapping paper I hung in my dining room. With a gifted frame and $2 wrapping paper, that project was super inexpensive. I also framed some clearance fabric several months ago that I never blogged about, so here is the lowdown on it (also a $2 project)! I found this sheer fabric in a clearance bin at Joanne Fabrics several months ago and decided to bring a yard of it home. I think I paid about $2. The colors caught my eye and the pattern looked like watercolor art. I brought it home, threw it in an old brass frame, and found a home for it in a little niche in the back of the house. This old frame was missing the glass, so I simply wrapped the fabric around a piece of foam board, used pushpins to secure it, and shoved it back in the frame. The fabric is exposed in the front. I love the pop of color and how it looks like “art”. Our walls are a very light grey/blue and I painted the niche with some leftover grey paint in my stash. I think it sets the stage for the colorful “art” work. There you have it! Another $2 framed art project! Drew turned six last week, and we had an indoor flag football/soccer birthday party at a local indoor sports complex. I think Drew has had a sports themed birthday party 5 out of the 6 years! It’s just who he is so we go with it! I shamefully happily did not have to do much in the creative department for this party, but I did make the cupcakes, as I always like to do.